You can save lots of money on your grocery bill if you follow these tips about saving money in the produce section. Keep your family healthy and save money too! You’ll even enjoy it more! Saving Money in the Produce Section! Every time we go to the grocery store we are consumed by many chooses about food; fresh vs frozen, canned vs fresh, pre-packaged foods vs making your own from available fresh ingredients. The question stands; How do you save money in the produce section? Have you ever just skipped the fresh produce section thinking it is too expensive to buy fresh? Believe me, you are not alone. I did a little research and according to the U.S. Department of Agriculture Americans do not consume the recommends amount of fruits and veggies a day. With the rising cost of food, many are turning away from fresh produce. Much of the increase in prices can be blamed for many attributes; raising the price in gas to bad crops. Whatever it may be, “WE” need to be smarter consumers. 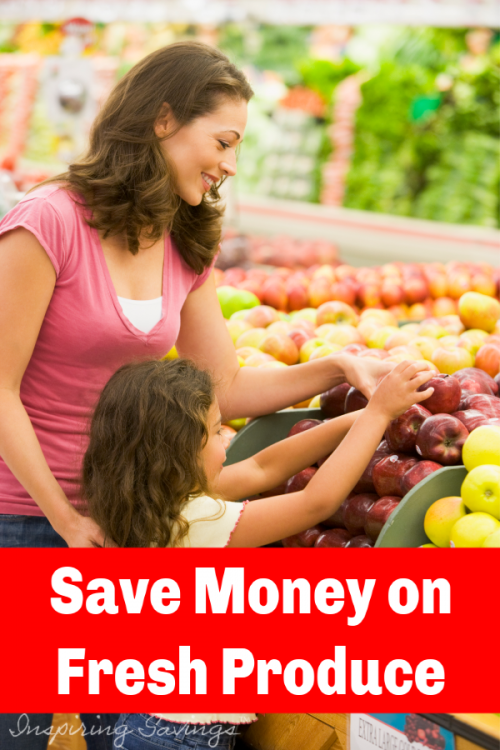 Let’s talk about ways to save money on produce easily in the grocery store. So, how do we save on fresh produce? Simple!! We scan our weekly flyers for the best possible deals each week. It is not to say, that you might discover that bagged spinach is a better deal than the loose leaf version. Compare your prices. The first thing you need to do to save money on produce is to learn about the products that you buy and what a good deal is for each. Did you know that your phone an actually save you money on fresh produce? There are a variety of Smartphone savings apps that offer fresh produce savings. Have you read my money saving apps for groceries post? Many of the listed smartphone apps in this article will give you cash back when you purchase certain fresh produce at your favorite grocery store. In season, locally grown food is usually cheapest. Menu planning around what is in-season will provide your family with nutritious and healthy meals. Produce is generally priced based on how hard or easy it is to attain it. It gives you a better understanding and know-how to which items are on sale and why. For example; Apples are on sale during the fall, citrus in the winter time and berries during the summer month. One of our family’s favorite spot is a local, out of the way farm that offers cheap organic fruits and veggies (Shhhh, our secret). Last year I got 15 pounds of tomatoes for just $4. I am Italian, so a big pot of sauce was made, canned and packed away for later use. This has the added bonus of supporting your local farming community. Have you heard that growing your own food is the next big thing? Not only is it the in-thing, but it helps your children understand where our food comes from and how it is grown. By growing your own, you can guarantee that the produce is organic and the price of seeds is well worth the turnout! Needless to say, growing your own produce is the number one way to save money without coupons. Nothing is worse than having to throw out food that has gone bad. But, if it’s a really good deal, and you think the food may spoil before you have a chance to eat it, look into freezing or canning the foods. We love to freeze grapes and bananas in the summertime. What measures do you take to save in the produce section? These are only a few of the best ways to saving money in the produce section without coupons. What other ways can you think of? I have to say that the only time I find farmers markets to be less expensive than the store is when I go and am able to get day old. Tho now that we are down to 1 kid at home ( out of 4)we can afford some of the fresh items that we couldn’t before we had a house full. We trip down to Schoharie ( our secret, but i WILL share!) and hit up Barbers and Shauls..Barbers you can get alot for a couple bucks at the day old counter. The corn is to die for! I cook and freeze what we aren’t going to eat that night. Am going to take a day trip over to my hometown of Rutland Vermont and check out thier Market..so many farmers that it is now located in a refurbished warehouse! !